She attacked Israel again at the event. Will Johnson covering C.A.I.R. Event in L.A. Thanks to @Feisty_FL for this shot. Patriot Protesters speaking out against #CAIR who are honoring the jihadi Congresswoman Omar at an LA Hilton. 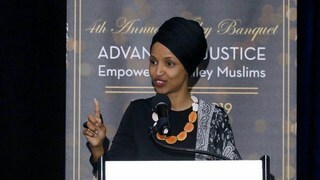 Protesters held up signs in support of Judge Jeaninewho was recently suspended from Fox News for a reasonable question about Ilhan Omar’s hijab and sharia law. At the same time, conservative street artist Saboencapsulated the real Ilhan Omar and sharia law in a series of unforgettable street artworks that popped up on bus stops and street benches.